In the wake of 2009 BDR mutiny, Prime Minister Sheikh Hasina asked for assistance from the US government to make sure “the [Bangladesh] military is really very careful” and accepting of the civilian authority, said a leaked diplomatic dispatch. The premier made the request in a one-on-one “off-the-record” conversation on November 5, 2009 with the then US ambassador James F Moriarty, according to the cable sent to Washington four days later. “The Ambassador commented that he still had concerns about civilian-military relations in Bangladesh and viewed the BDR Mutiny as a symptom of historically poor civilian-military relations,” said the cable posted on the whistleblower website WikiLeaks. PM Hasina had emphasised establishing a new structure to expedite progress in civil-military relationship, another cable sent to Washington on May 28 quoted PM’s Adviser Gowher Rizvi as saying. At a meeting with the then US ambassador James F Moriarty on May 26, 2009, Rizvi said the prime minister continued to look for ways to tackle a key priority, strengthening civil-military relations in Bangladesh, said the cable. “Early in her tenure as PM, Hasina talked about establishing a civ-mil structure that might include a Joint Chiefs of Staff and/or a Defence Minister/Advisor,” the dispatch quoted Rizvi as saying. It noted there was no separate defence minister in Bangladesh then; the prime minister held the defence portfolio herself. “The Bangladesh Rifles mutiny in February made this objective both more difficult and more urgent, Rizvi observed,” the cable said. Before meeting Rizvi, the then US ambassador held a meeting with LGRD Minister Syed Ashraful Islam who told Moriarty that he urged PM Hasina to appoint a full time defence minister, said another cable. Ashraf said the BDR issue seemed to be settling down. He was critical of opposition efforts to second guess the government’s handling of the issue, said the cable. The ambassador stressed the importance of a credible investigation into the mutiny and noted the US government concerns about deaths in custody of accused mutineers. The ambassador noted US government’s offer to help Bangladesh to strengthen civil-military relations. He underscored the need to look at roles and responsibilities of different institutions, including the defence ministry and parliament. Bangladeshi officials have said they expect a result in the arbitration over maritime boundaries in the Bay of Bengal by April, as a leaked US cable reveals that Dhaka was seeking US assistance after a Burmese military build-up stemming from the dispute. “The arguments [over boundaries] will be held in two phases ending on 24 Sept and the ruling is expected in April,” Bangladeshi Foreign Minister Mijarul Quayes told Reuters on Sunday. The initial complaint was submitted to the UN International Tribunal for the Law of the Sea (ITLOS) in 2009, but the hearings did not commence till 5 September this year. The dispute concerns a semi-submersible drilling platform owned by Swiss-US oil firm Transocean Inc, but was leased to South Korea’s Daewoo. Daewoo, along with their partner, Kogas, were given permission to explore for oil and gas in the disputed AD-7 offshore block by the Burmese authorities in 2008. The rig was escorted into the contested waters by the Burmese navy. 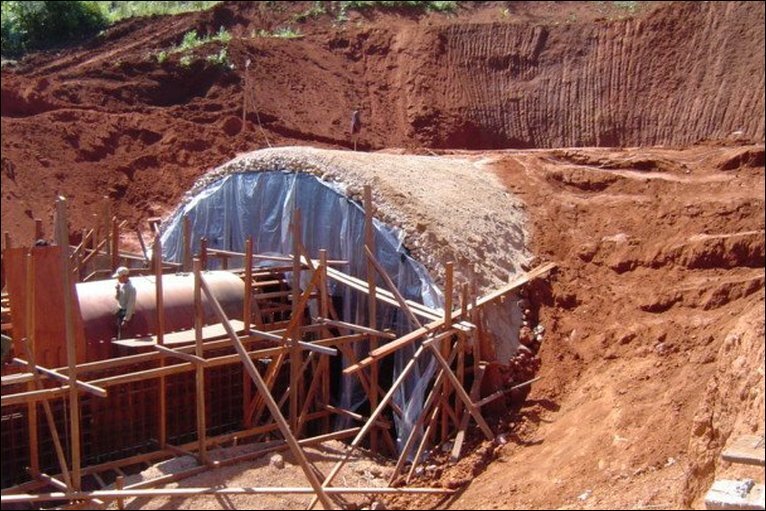 Several senior Burmese military officials are reported to have been arrested over the leaking of this photograph - appearing to show tunnels built in Burma with the help of North Korean experts for military purpose. At the time news surfaced of a military build up on the shared land border but a recent cable released by Wikileaks indicates that the Bangladeshi government asked the US for help. “Army Chief General Moeen Uddin Ahmed asked the Ambassador [US] for assistance to assess the buildup, specifically requesting satellite imagery to assist the Bangladesh Army see the scope of the Burmese military presence and track further developments,” the cable, dated 18 December 2008, notes. Bangladesh is desperate to secure energy supplies, and the nation’s state-owned oil company, Petrobangla, has signed deals with US oil company Conocco Philips to explore in its waters. British authorities have collaborated with Bangladeshi security forces to hunt British nationals and interrogate them outside the country in secret bases where inmates are known to have died under torture. Guardian quoted sources in both countries as saying London used Bangladeshi intelligence agencies and police forces to cross-examine suspects with dual British-Bangladeshi nationality in operations during which a number of detainees became victims of extreme forms of abuse. In one of the meetings between British and Bangladeshi officials, former Home Secretary Jacqui Smith met officials of Bangladeshi Directorate-General of Forces Intelligence (DGFI) which was criticized for its human rights record by the Human Rights Watch just about two months earlier. According to a DGFI officer, Smith, whose department had earlier reported prevalent torture in Bangladesh, privately called on the agency, during the meeting, to examine the case of several people whom she described as suspicious. Reports said a number of British suspects became subject to torture in the secret interrogation center known as the Task Force for Interrogation cell (TFI). The inmates reported horrific torture methods including being forced to stand still for six days with their hands chained to bars above their heads, receiving electric shocks and even being strapped to a chair while a drill was slowly driven into their bodies. This is while Smith’s own department had mentioned the very torture methods used on the victims as commonplace practice by the DGFI. Reports claimed of MI6 and MI5’s complicity in the interrogation and torture cases sanctioned by senior government officials including Smith, former foreign secretary David Miliband and former Home Secretary Alan Johnson. This comes as earlier WikiLeaks cables revealed the British government trained the Bangladeshi rapid action Battalion (RAB), also involved in the torture cases. RAB, which were described as a “death squad” by the Human Rights Watch, were blamed for hundreds of extra-judicial killings and human rights violation cases before receiving training by Britain. Further evidence has come to light of the relationship between British governments and a Bangladeshi paramilitary death squad. A leaked US embassy cable showed that the Rapid Action Battalion (RAB), responsible for hundreds of murders, received British training in “investigative interviewing techniques”. It has emerged that British authorities passed information about British nationals to the group—while they were held at a secret interrogation centre where inmates have died under torture. Gulam Mustafa, from Birmingham, was beaten and tortured with electric shocks. According to the Guardian newspaper, Bangladeshi police officers say his arrest had been at the request of MI6. Former Labour ministers Jacqui Smith, Alan Johnson and David Miliband all have questions to answer over torture in Bangladesh. The foreign office says the British government continues to “provide a range of human rights assistance” in the country.